Dr. Marc Minch graduated from the University of Florida College of Dentistry in 2002. He also received his undergraduate degree in Electrical Engineering in 1995 from the University of Florida. Prior to entering dentistry, Dr. Minch was a product engineer for Motorola in Boynton Beach, FL. 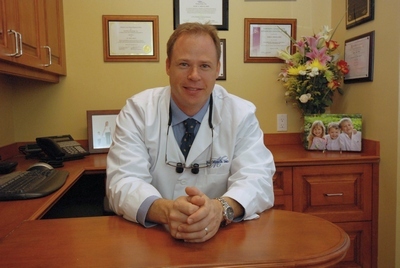 Practicing at his current location since 2004, Dr. Minch is an active member of the American Dental Association, the South Palm Beach Dental Association and the Academy of General Dentistry. In July of 2008 Dr. Minch was awarded the honor of Fellow in the Academy of General Dentistry. Leading up to this accomplishment, Dr. Minch has completed over 1000 hours of continuing education in Implants, TMJ/Bite Dysfunction, Cosmetics, Gold inlays, and Invisalign with some of the top educators and institutions in dentistry such as the Dawson Center, Pankey Institute, LVI, Rosenthal Institute and CCADS. Dr. Minch continues to expand his education so that he is able to provide exceptional expertise in the latest dental procedures, technology and overall health as it relates to dentistry. Dr. Minch also gives back to the community by volunteering at Community Gardens in West Palm Beach. Dr. Minch grew up in South Florida. He is married to Kristen and has three children, Caden, Morgan, and Mason. After playing soccer for 26 years, Dr. Minch is now coaching his son's and daughter's soccer teams.